True Confession: I wasn’t a baseball fan growing up. Oh, I followed the Giants and A’s a bit when I was little and in California. I mostly cheered the Giants so I could needle my dad who cheered for the Dodgers. I mostly cheered the A’s because they were cute and had even cuter uniforms. But, then we moved to North Dakota and my dad really preferred basketball and football. The only times we followed the “local” Minnesota Twins were on the days when enormous thunderstorms rolled through and my dad would turn on the radio to follow the weather reports which would interrupt the Twins’ broadcasts. I’m sure somewhere deep in my brain I now connect the Twins to killer tornados. After college, I left North Dakota (and frigid 40-below winters) and made my way to Washington, DC. Not long after, in 1988, I tagged along with a busload of officemates on their annual trip to Baltimore’s Memorial Stadium to see an Orioles game. They always got to leave work early when they went up for the game, so it wasn’t that hard to convince me to go. The Orioles had started the 1988 season 0-21. I felt really bad for them. Tom Boswell, a Washington Post columnist, was reporting each loss as the total mounted. I didn’t know much about baseball. I knew even less about the Orioles. But, I did know that this poor team needed me. It was really no big thing. I was going to a game. It was cheap. It was a good enough way to spend an evening. We got there, and everyone piled off the bus and most everyone knew where they were going, except me. I just followed behind … around the stadium and up the concrete stairways to the upper deck. Everyone filed out to their seats, and when I got to the top of the entry way, I saw the most amazing thing. One of the greenest fields. A perfect diamond cut out of it. A wide, green, amazing field. And, a bunch of guys just tossing a ball around. It was the most beautiful thing I had ever seen. Everyone needs a “home” – whether it’s baseball or Yoga or something, someplace that gives sanctuary from the stress and worries and labors of daily life. And, so I name Charlottesville, Virginia as my number 1 Spring Training location. 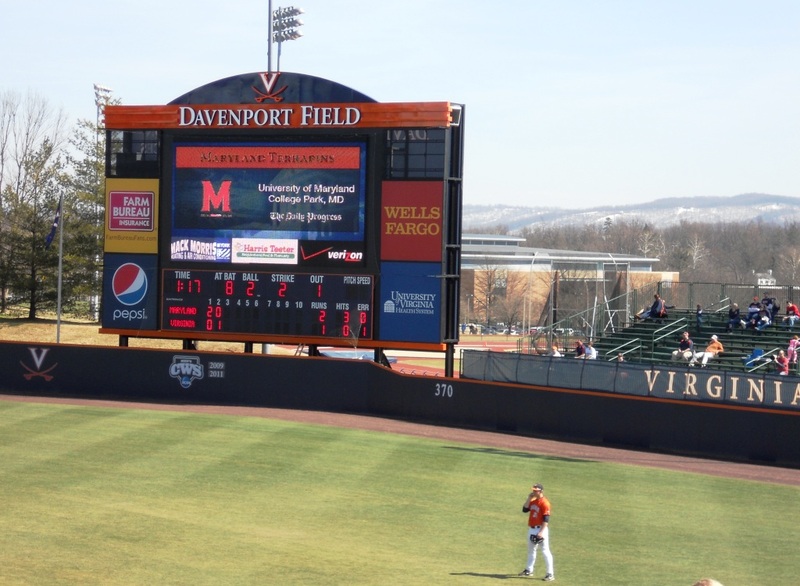 Today, the University of Virginia Cavaliers play baseball at Davenport Field. Charlottesville baseball in March is a chilly affair, and, yes, that’s snow on the mountain. 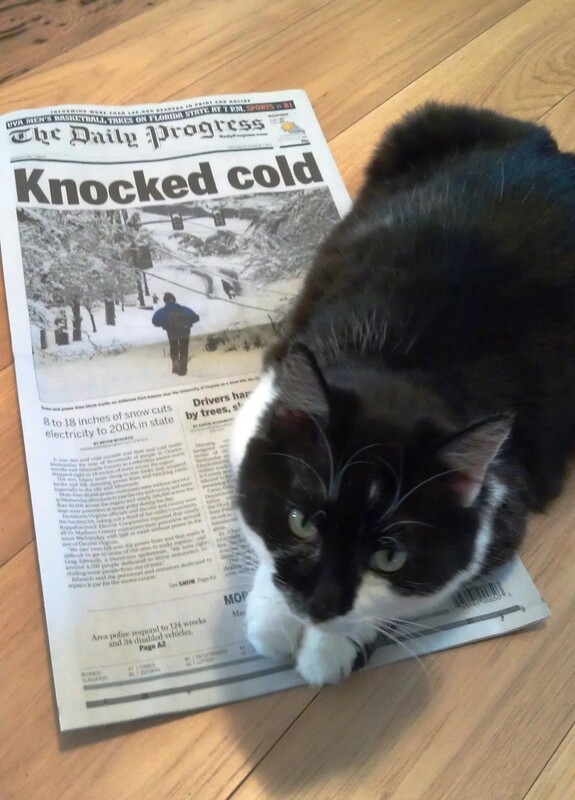 Stevie reminds you that it often snows here in March, sometimes a lot. The UVa Cavaliers beat Miami yesterday 8-1. Their record this season is 25-2 and they are currently ranked #5 in the nation. In 1961, the Washington Senators/Nationals/Senators became the Minnesota Twins. Spring Training ran a little long this season, to accommodate players who were part of the World Baseball Classic. For Kevin Edds’ article on Spring Training in Charlottesville, click here. And, there are plenty of updates on present-day baseball at the University of Virginia. Just click the “University of Virginia” tag at the bottom of this post. This entry was posted in Baseball, Baseball History, University of Virginia and tagged Boston Red Sox, Charlottesville, Davenport Field, Minnesota Twins, spring training, Walter Johnson, Washington Nationals by Jackie, The Baseball Bloggess. Bookmark the permalink. Really Cool, Jackie!!! Wondered how you first got acquainted with your beloved Orioles!! Now, I know… :-) Batter Up!!!! Hi Kevin … You rock! 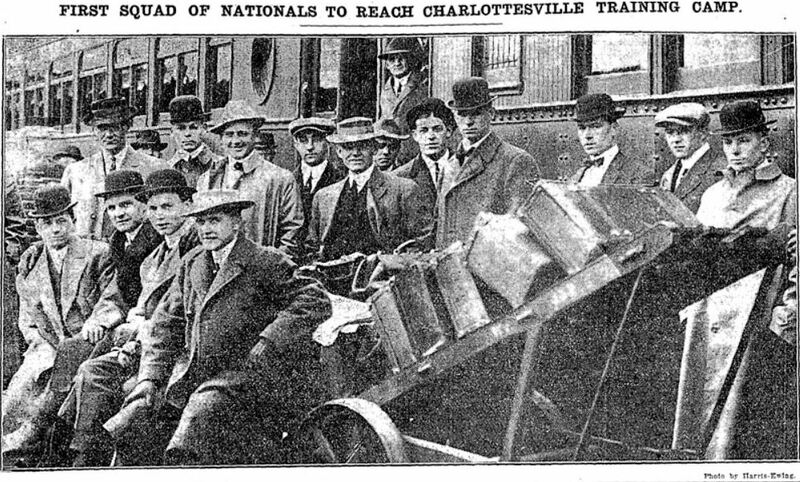 I read a book about Spring Training and saw a passing mention to Charlottesville hosting spring training in the early 20th century. I was so delighted to see your in-depth article on Charlottesville’s baseball connection. Thanks for the update … and, Happy Birthday to Lambeth Field!